I try hard not to be acquisitive, though our home is perhaps more crowded than it might be if I were better at the task or cleaned at work less and at home more. Around the time of What Cheer Day, I became rather obsessed with teapots. In the end, I did not have my fabulous teapot for What Cheer Day. In fact, my fabulous teapot arrived just this past Thursday, after patient stalking on eBay. 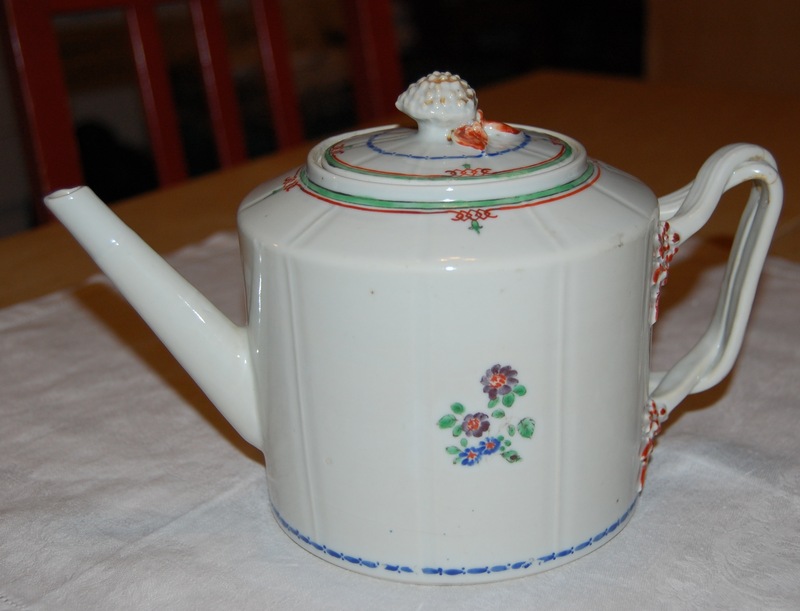 It arrived with a bonus of five cups and a saucer, most with mends, but the pot itself has just a handle flaw or mend (typical, and seen, along with wear, in some museum pieces, too). The quantity of cups suggests that the previous owner had a relationship with them not unlike the one you might develop with a large litter of kittens you were fostering…adopt one, get another! Just to get them out from underfoot. The cups and pot reminded me of the difficult meals and teas Elizabeth Bennett takes with Maria Lucas and Lady Catherine whilst visiting Mr Collins and his new bride Charlotte Lucas. 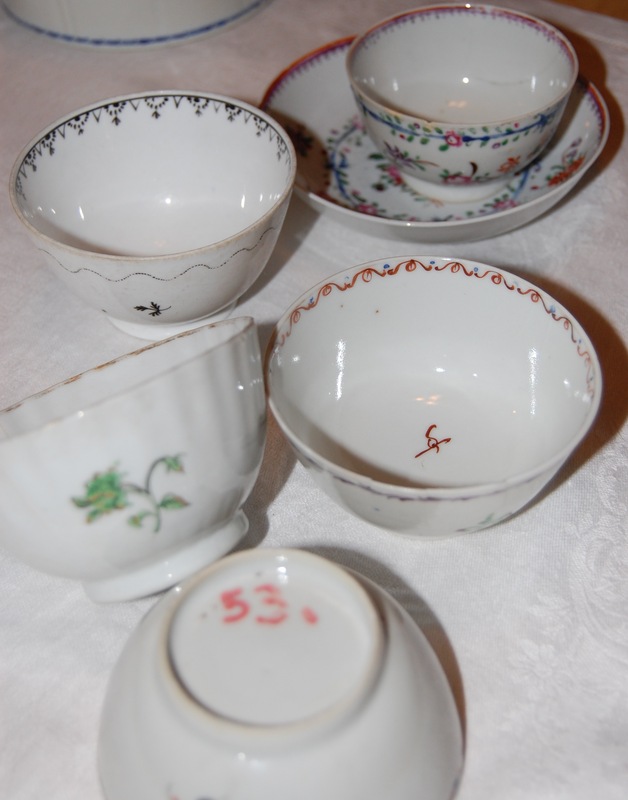 There’s a tension in these cups, some combination of the dainty and the strong, some slightly misshapen (not all makers were equally skilled) that calls to mind the polite verbal combat of tea parties. I washed the cups, and was reminded of the duties of maids to clean and care for these delicate items, the kind of thing they were unlikely ever to acquire, though there were grades of china then as now: what sat on John Brown’s table was not what sat on the Dexter’s table, or at least not in the same quantity. The quantities of china coming into Providence and the rest of the Eastern seaboard after 1788 were enormous: in 1797, dinner sets of 172 pieces could be ordered at Canton for $22, and included 6 dozen large flat plates, 2 dozen large soup plates, 2 dozen small dessert plates, 8 pudding dishes, 2 large tureens, dishes and tops, 2 smaller ditto, 16 dishes of various sizes, 6 sauce boats and stands, and 4 salt cellars. 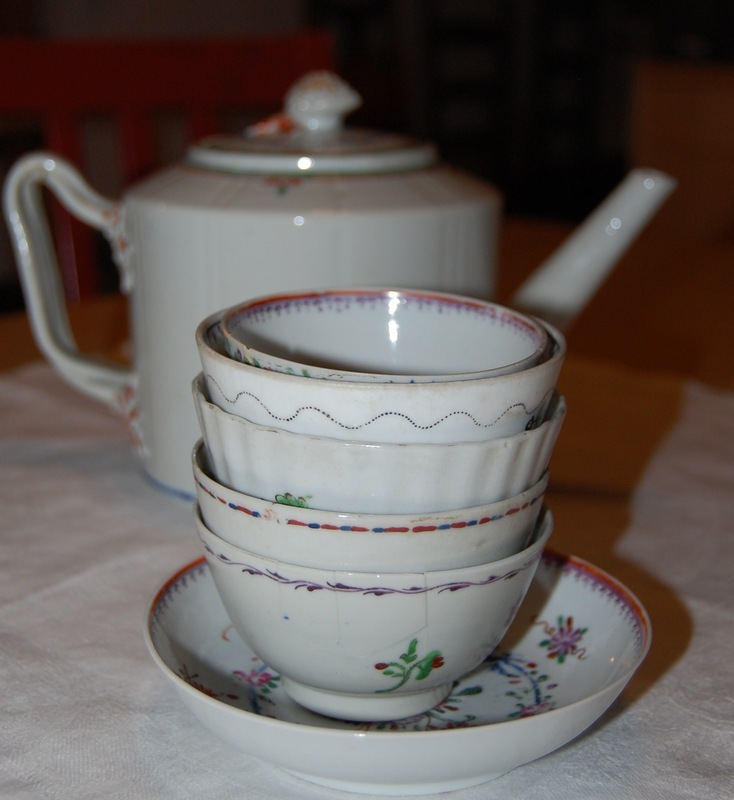 Tea and coffee sets of 81 pieces were bought in Canton for $6 to $9! Just for dinner and tea, you could have 253 pieces of china, and we haven’t even begun to get into custard cups, cache pots, and garnitures! The indifferent pieces I have acquired may have started out as kaolin, feldspar and quartz in Ching-te-Chen, 200 miles west-southwest of Shanghai. 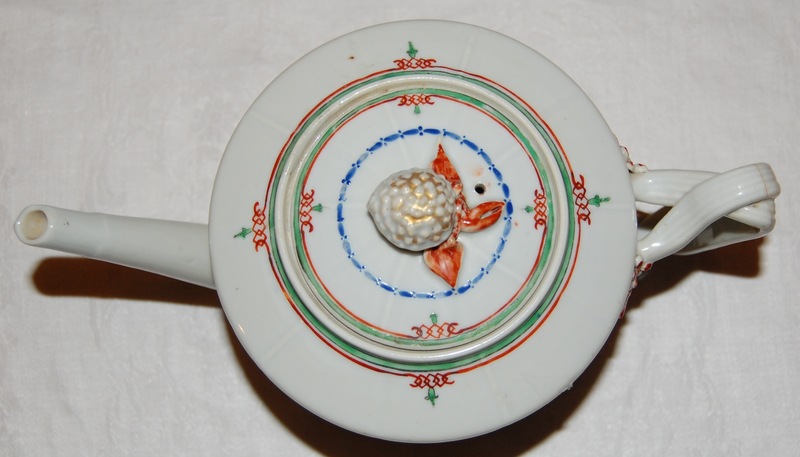 There were important porcelain manufactories there, and porcelain wares traveled by road and boat to Canton, where sets were customized to meet specific orders and then loaded onto ships bound back to America, six months or so after the order was placed in Providence, Salem, or Boston. 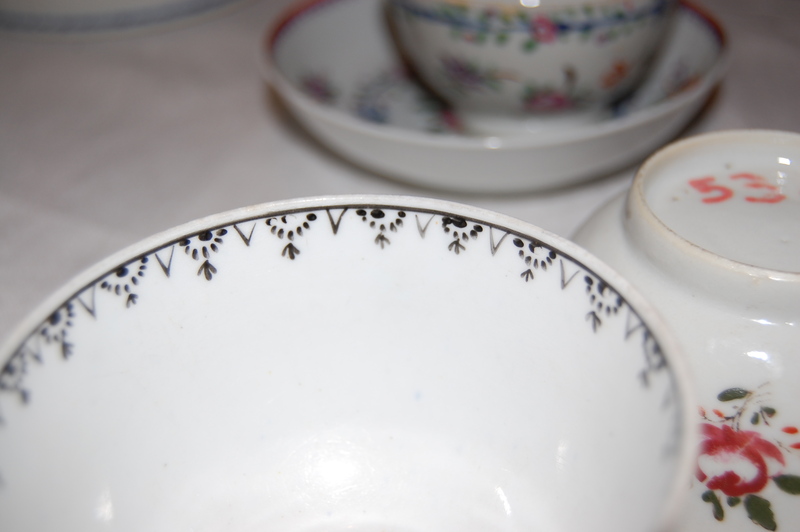 It’s a lot of work for a fashionable sip of Hyson or oolong, and no wonder cups and pots were mended, saved, and reused. I do, too! It’s called grisaille, and I’ve seen tea pots and coffee pots in that style. I have a collection of funky teapots, but none as delicate and valuable as this. Just beautiful! Didn’t realize the old china cups didn’t have handles! When did that come into being? I’m not sure about handles. They seem to come sooner on coffee cups, and are certainly present on pots de creme. This isn’t my first tea pot… we have one that was Mr S’s grandmother’s, and another that was a wedding present. But somehow I got the yen for this, and there you are: Mr S never wants to hear “tea pot” again! Last spring I was on a teapot quest for a small gathering on the porch. Okay, I was obsessively looking for months, wanting just the right teapot. With a week to go, I settled on a simple silverplate piece from a rather out of the way shop. I didn’t see any flaws or repairs. I didn’t even notice any problems as I washed and dried it. Well, the day came. I warmed the pot. I filled the pot. I brought it out to my nicely dressed porch, placing it on the serving tray. A bit later, I discovered the water filled the tray rather than the pot. Oh, my goodness! What a terribly cautionary tale! The repaired one was stapled across the bottom, as they are, but I just didn’t trust it. I could imagine exactly the scene you have painted. I am so sorry about your teapot!